Maximize Your Workout by Recovering Like a Champ | Valet. If you've been watching the Olympics, you've likely noticed some pretty intense recovery methods for the world's best athletes. From cupping and extreme stretching to neck-deep dunks in tubs filled with ice water, these guys will do anything to heal and alleviate the pain that comes with such epic training sessions. We mere mortals will probably never need such drastic measures, but that doesn't mean that you don't get sore after a long bike ride or workout in the gym. And if you're only focused on what you're doing while you're working out, you'll be missing out on all the muscle-building and toning your body does when you're finished. Here's how to boost your recovery to get the most out of your fitness. Your body repairs itself when you go to sleep, and studies have shown that lack of proper sleep will have a significantly negative impact on your performance during your workout and your body's recovery afterwards. And that's largely due to the hormonal secretion that happens during sleep. Your body undergoes protein synthesis while you're asleep and that's when muscle-building anabolic hormone concentrations and activity increase as well. So an extra hour after a hard day of activity or a nap after a brutal workout could do your body good. When your muscles are tight and sore, a lot of that discomfort occurs when our muscles (along with the connective tissue known as fascia) gets knotted. 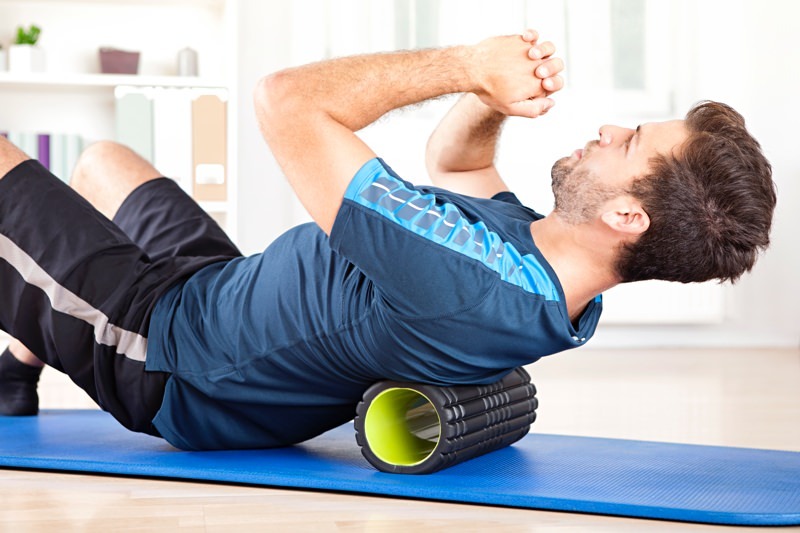 Multiple studies have proven that rolling your muscles out with a "hurts so good" foam roller substantially reduces muscle soreness while improving range of motion. The tool can target trouble spots, work to remove those knots and stiffness while speeding recovery by increasing blood flow. And bonus, one of the studies (PDF) also found that a "post-exercise massage can generate well-being, a reduction in anxiety and an improvement in mood and perceived relaxation and recovery." Dehydration can reduce performance potential, but also diminish the body's ability to repair itself. Exercise increases the body's need for water and electrolytes. And be mindful of water lost from sweating; one source recommended roughly 1 liter of water for every 1,000 calories expended. And if you're suffering from stiffness or soreness, tart cherry juice has been proven to help endurance athletes recover quicker. You might chuckle at the guy pounding the shaker bottle full of protein shake, but he's feeding his muscles the necessary fuel to grow and improve. Aim for 20 to 40 grams of protein after each workout. And then have a light, protein-rich snack (like yogurt, cottage cheese or hummus) before bed in order to give your body fuel to keep repairing muscles overnight. Then, in the morning (after you've given yourself plenty of sleep), your body could use the nutrients in a high-protein breakfast to continue rebuilding and recovering. You don't have to go full ice bath. A cold shower can significantly reduce soreness and inflammation for up to 24 hours after intense exercise. Supercharge your nutrition (with these common snacks) to see better results.